A secretariat of the REDD +Working Group was established at the Rain Forest Research Institute (RFRI) Jorhat (Assam) on Thursday for sharing of knowledge and information relevant for REDD+ Himalayas project being implemented in the northeastern States, a press communiqué issued by RFRI said. The REDD+ Working Group for northeastern States in a meeting at the institute located near Sotai Ali in Jorhat district also prepared a road map for implementation of REDD+ initiatives in the region. REDD + refers to Reducing Emissions from Deforestation and Forest Degradation in Developing Countries and role of conservation of forest carbon stock. This is widely accepted as climate change mitigation option under the United Nations Framework Convention on Climate Change (UNFCCC). The Paris Agreement on climate change has also reaffirmed the role of REDD + action to meet climate change mitigation goals at global levels. India is one of the partner countries for preparation of a national strategy or action plan for implementing REDD + aims to incentivise developing countries to reduce emissions from deforestation and forest degradation, conserve forest carbon stocks, sustainably manage forests and enhance forest carbon stocks. The Indian Council of Forest, Research and Environment (ICFRE), Dehradun, under which RFRI operates, is an implementing agency. ICFRE in collaboration with the International Centre for Integrated Mountain Development (ICIMOD) has initiated a project on ‘REDD + Himalayas REDD +’. Under this project, capacity-building is being focused on the north-eastern States of India. The programme aims to provide assistance for developing and implementation of REDD + actions, focusing on trainings, technology sharing and knowledge dissemination. The expected outcome is a strategy and action plan at each level, community, sub national, state and national levels and improved understanding of scientific knowledge for precise estimation of carbon stocks. In order to initiate and scale-up REDD +actions in the north-eastern States, a REDD +Working Group has been formed to facilitate actions in these States under the REDD + Himalayas Project. The REDD +Working Group comprises the Director of RFRI as the Chairperson and a nominated scientist of RFRI as Member-Secretary and 13 members representing the north-eastern States as well as Kolkata and the Assistant Director General, Biodiversity and Climate Change, ICFRE. Thursday’s meeting was held under the chairmanship of RSC Jayaraj, Director of the institute. The working group meeting was attended by senior forest officers of all eight north- eastern States, academicians, Non-Governmental Organisations (NGOs), community representatives, ICFRE and RFRI, Jorhat. The inaugural presentation on introduction of REDD+ and its implementation at international and national level was delivered by VRS Rawat, REDD+ Consultant and former Assistant Director General of ICFRE, Dehradun, the communiqué further said. Rawat, Scientist In-charge, Biodiversity and Climate Change Division, ICFRE, Dehradun gave a brief presentation on structure and function of REDD+ Working Group for NE States. Professor BK Tiwari from the North-Eastern Hill University (NEHU), Shillong delivered a presentation on his work done on REDD + at NE States. Officers from States of Nagaland, Manipur, Tripura, Sikkim, Mizoram, Meghalaya and Assam shared the initiatives taken by their respective States. Tambor Lyngdoh who is the pioneer of executing REDD+ Project in Meghalaya delivered a presentation and shared his experience. 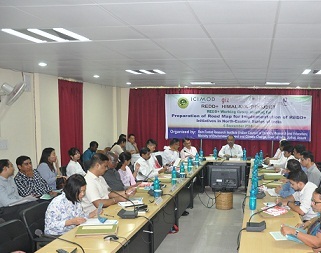 Detailed discussion was held on the preparation of road map for implementation of REDD+ Actions in NE States. MZ Singson, Head, Forest Research Centre for Bamboo & Rattan, Aizawl, explained about the ICIMOD-funded REDD+ Himalaya project currently on in the State of Mizoram. On the occasion, a booklet on Volume, Biomass and Carbon Table for Meghalaya published by RFRI, Jorhat was released. DJ Das, Scientist, RFRI and Member-Secretary of the Working Group conducted the mitigation approach that has been developed by parties to the UNFCCC, the communiqué concluded.